HiDens Mail Client scales to the most sophisticated communicational needs while making it easy to transfer what you need. HDMP protocol offers bolstered security and privacy measures to ensure that your communications and identity remain safe. 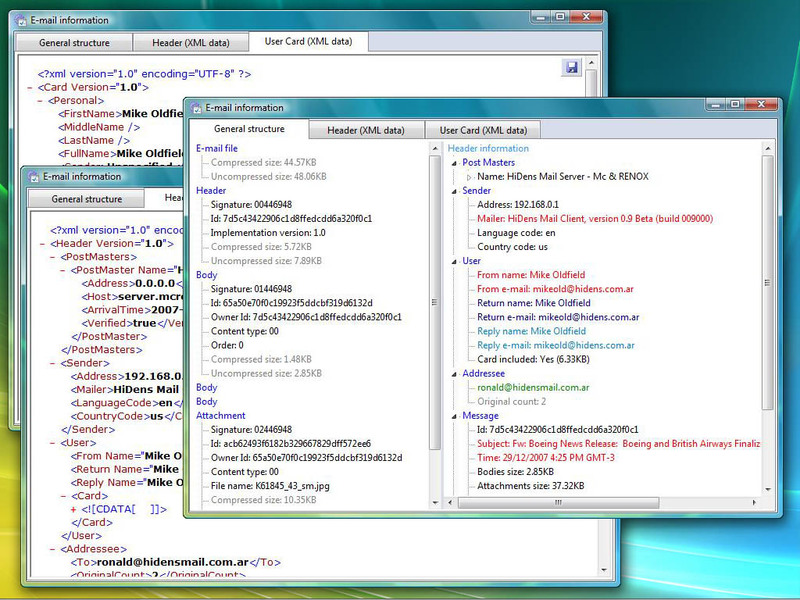 The HDMP protocol (High Density Mail Protocol), used by HiDens Mail is not compatible with the current e-mail exchange standards SMTP (Standard Mail Transfer Protocol) and POP3 (Post Office Protocol 3), since HDMP features a completely different structure which makes it extremely efficient, fast and safe, eradicating the main causes for SPAM, phishing (ID forgery) and ill-intentioned email. 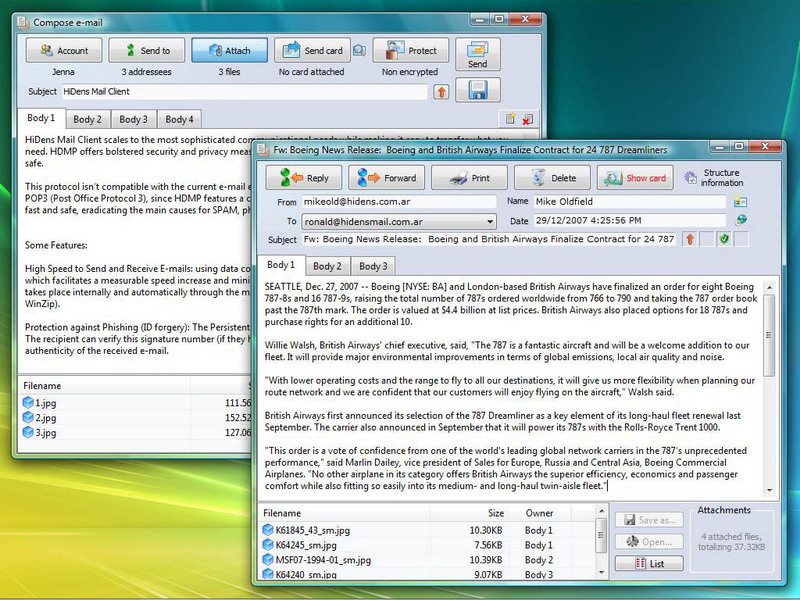 High Speed to Send and Receive E-mails: using data compression it is possible to reduce the e-mail size up to 10 times, which facilitates a measurable speed increase and minimizes information traffic across the net. This compression always takes place internally and automatically through the method “Normal Deflate 08” (currently used in applications like WinZip). Protection against Phishing (ID forgery): The Persistent Digital Signature (PDS) allows the ID validation of a sending user. The recipient can verify this signature number (if they have the sender’s PDS Signature) and in this way verify the authenticity of the received e-mail. Protection against SPAM: When sending an e-mail via HDMP, this goes through a series of servers till it gets to its final recipient; each intermediate server doesn’t send the e-mail to the next server without verifying before that the e-mail really comes from the preceding server. This reverse connection takes place after the primary connection, which allows a complete verification of the trace. Finally, if it is not possible to fulfill this verification at any point of the e-mail trajectory, the e-mail is destroyed and doesn’t get to the receiving user. This prevents the sending of SPAM using software known as SPAM Pumps (software for massive SPAM forwarding). Information Protection (Data Encryption): Activating this feature protects the content (text of the message and attached file/s) through the use of encryption methods like AES, 3DES, etc. The AES cipher is currently used by the FBI for “Top Secret” level protection. 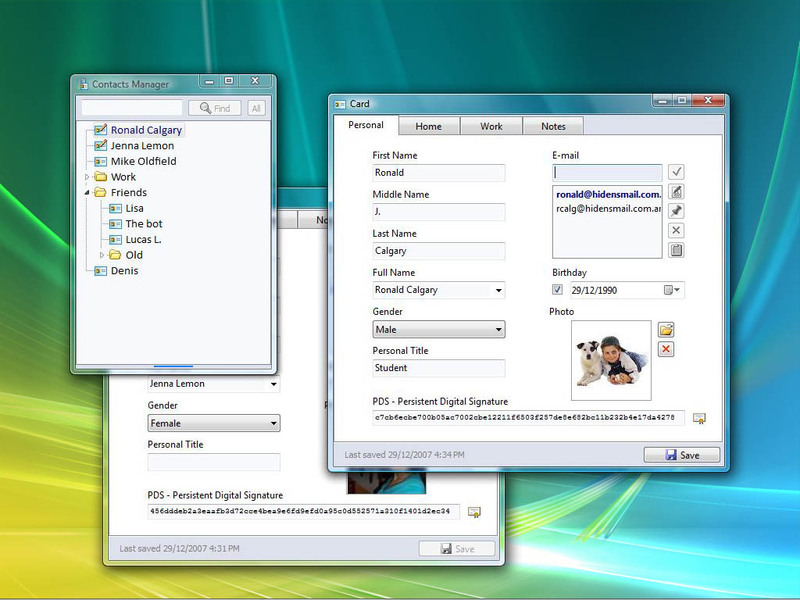 The decryption can be External (provided by the receiving user) or PDS. Automatic notification of new e-mail received. 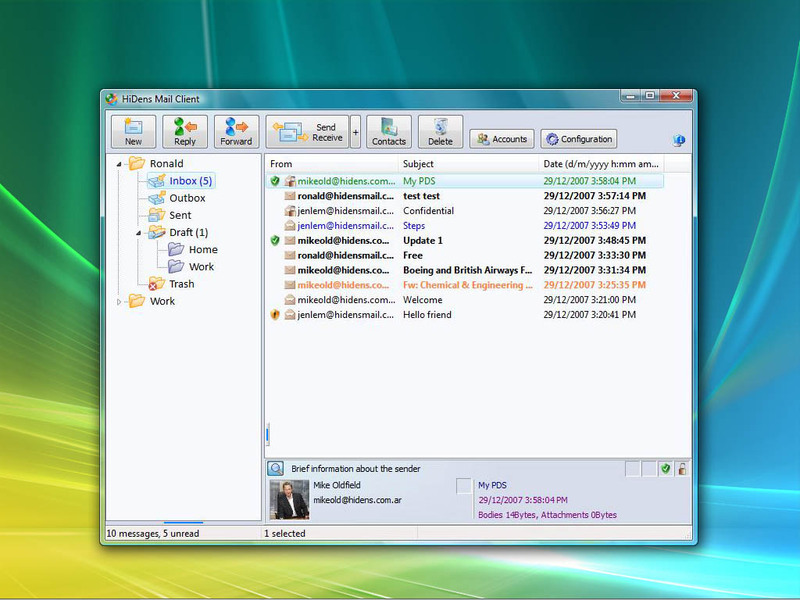 The e-mail client remains active in the Windows's Trayicon, periodically verifying for new e-mail, downloading it and sending notifications to the user. Support HiDens Mail today ! If you find this system interesting and useful, you are invited to collaborate with its development. A good way to collaborate is through donations. The money of donations will be used in upgrading equipments and on helping me to take focus on the project development.